This is an idea I’d like to follow up on myself! I passed :) The website is very well designed. I might enroll again to get better marks. Dropped after I realized prof was using his own book. That’s like using a word in its own definition. Though it sometimes can work, not here. If you were an author and wrote a book that you thought was the best way of introducing a topic, like electronics and circuits; wouldn’t you use that book to teach people? If you thought there was a better way to teach it, wouldn’t you have chosen to write your own book differently? It follows that if you write a book on a topic, and did what you think is the best approach, you SHOULD choose your own book to teach a course. if you are an engineer, you always think your thoughts are the best. That is a quite blind and poor reason. The book is a good textbook and expands what is teached in the lectures. Although most times the textbook is not necessary at all. 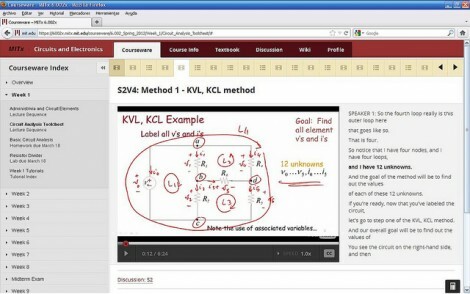 Even then, the textbook is free to access thru the course interface. The extended parts of the book also are free to download in pdf form. And in any case, nobody is forbiding you to complement the material with other textbooks or specialized books. You really missed a great and fun course. Many people just make up excuses to justify their lack of motivation to learn or plain laziness. Definitely motivation deprived.I can appreciate your comments and agree that I should have stuck it out.It is discouraging though when you look to the reference material for further incite and it is verbatim to the lecture. This fall seems that the course will be offered again thru EdX, the new joint platform between MIT and Harvard. Also they stated that will offer other 4 new ones. I agree completely. The negative reviews of the course tended to be written by early dropouts on their “EE” blogs or in one case a snarky professor. I do think the course takes more than one afternoon a week — just watching the weekly videos takes 2-3 hours and the problem sets a few hours on top of that. The text is pretty good, though not necessary to complete the course. The lectures were thorough enough that you could generally do the homework and exams just on what was covered on the lectures. Thia is an introductory course, no surprise the book is verbatim to the lectures in a large part. When kids start learning math the teacher still instructs 2+2=4 when though the books includes that same information. Anyone is free to obtain the NEETS modules for free to use in self-education, but my guess is that the military instructors cover that material verbatim in the class room lectures. Yes a good instructor will impart extra material that’s difficult to put into the print form, no doubt that occurred in the free online course. You may cheated only yourself here, and where else you applied your logic. In University I had a thermodynamics class where we used the professor’s book. Turns out, that book was the most-widely used text for introductory MechE thermodynamics, translated into over 25 other languages. I was EXTREMELY fortunate to have Dr. Moran as a professor. I learned more that class, and that professor, than I did any other throughout my University years. It can be a very good thing to have the professor use their own book. Though, I’ll agree that there are times it is an absolute nightmare. I agree with the general assessment as abstracted in this post (I found the Google Translate of Jorge’s page too painful to read). I thought the class went very well and improved over the course of the class (as expected for an initial trial program). My only complaints about the lectures was the high degree of repetition (I swear I once heard “To recap what you just heard a few seconds ago…” at one point). The other “negative” point was that because of MIT rules the last week’s material was not covered on the test and the last two week’s material had no problem sets to go with them. I found this got out of practice in solving the work, and made the final a little harder than it needed to be. I would have liked more homework, even if it didn’t count towards my grade (because of the “drop two lowest homeworks” policy, the final two homeworks didn’t count towards my grade either, but they were very helpful to do). The tools provided for doing the homework was well-designed. I especially liked that the questions of the form “enter an algebraic expression” would take many equivalent expression, not just specific canonical forms. The screenshot above is just one form that screen could take. You could turn off the captions, and the video would enlarge to fill the space; you could collapse the Courseware Index panel, and the video would enlarge to foll the space. I don’t know if it was added mid-course, or if it was from a browser extension I was using, but there was even a full-screen mode with the captions as an overlay on the right side (which you could turn off). It was very nice to have those options. For this trial run of 6.002x no fee was required for a certificate, but they did indicate that that may be different in the future. I sort of disagree with Blaise Pascal. I thought the lectures were stronger at the beginning. He was a bit more organized, and did a better of job of working in the “rhetorical question” pages. By the end, he was more apt to say “pause the video” and try for yourself. I felt like he was tired, and didn’t have as much time to polish things at the end (and some videos had errors in them and should have been re-recorded). Overall, I liked his lectures, but his board-work is atrocious. You might not notice when watching a video, but if you ever went back to just the slides they were almost useless. He didn’t work from top to bottom or left to right. So if you weren’t actually watching the slide be created, it was hard to decipher (especially since his handwriting wasn’t stellar). I liked the class, but I can definitely see room to improve. I was really pleaed with the mitx experience. The courseware seemed amazing and the prof is rockstar-good. The idea of taking the course appeals to me. I wonder about 2 things which might be a hindrance. 1) Is there any dependance on Windows? The screenshot looks like it was from a Windows machine. Supporting Windows users is fine, since they are numerous. But I don’t allow it on my network. 2) Is there any need for Adobe Flash? I won’t install it for many reasons, so if the curse needs it, I might as well forget taking the class. It worked fine in Firefox 10-13 and should work in Mac and Linux also. Chrome had some minor issues, but remember that this was an experimental first public course. It uses flash if available, if not then uses HTML5 (The videos are hosted on youtube) and the developers stated that it worked well despite some caveats with the broken googleapis from time to time, (but fortunately not during all this course). They are thinking even expanding it to movile devices, which make complete sense. Resuming, no windows nor flash needed to take the course. There is no dependence on Windows. I took the course using my home Linux box, using the Chrome browser. I don’t know about Flash. I don’t have a problem with Flash, so I didn’t test it. The main aspects which might have been Flash were the lecture player and the circuit simulator. The lectures use YouTube as a backing-store, and it didn’t look exactly like the standard YouTube player. I know YouTube supports HTML5, so I suspect that the lectures work fine without Flash. Thank you. With confirmation from S and you, I feel good about signing up next semester. There was an email reminder for the final. The course took 5-12 hours a week for the problem sets, depending on where in the course. I thought the quality of the lectures was excellent. As for the repetition, “Repetition is the mother of studies” — repetition is how you learn things. Respectfully that logic flies pass me. doesn’t matter who wrote the book, a textbook and lectures should compliment each other. I guess that could be viewed being like using a word to define the meaning of that word, but I can’t see any utility in doing so, when the goal is to educate oneself. I took the course. If you want to learn more about electronics then this is an awesome course. Well worth the effort. I work full time and managed to get a B. 1% below an A. Arg : ) Good times. but else that very good information and great prof A.A. I don’t know what midterm *you* wrote, JulsPower, but my midterm didn’t ask for any algebraic answers. The assignments did, but we had unlimited attempts to get it right. Without wanting to seem trollish, I think anyone who thought it was a great course has probably never done a real Uni based Degree. The tiny, pokey whiteboard system is awful, Dr Agarwal repeats himself as many as 4 times, and the book is probably one of the driest introduction to EE I have seen. To anyone who has done an Open University or similar course, 6.002x feels very primitive and under-developed. One afternoon a week is just not feasible unless you already have a very thorough understanding of the subject. As with most real world lectures, the video lectures and tutorials alone only cover perhaps 20% of the course material, relying on the textbook to fill in the rest. As someone who does have a Uni-based degree, I thought it was a great course.